[miau] There is something about popular culture that is utterly obsessed with Zombies. 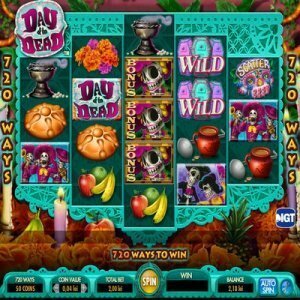 The Walking Dead, dozens of video games, big-screen movies, Halloween costumes, and even online video slot machines, like the Day of the Dead slots. Although Day of the Dead is much more a Mexican themed game, taking its inspiration from the famous celebration of the country, there is still very much a strong zombie vibe that emanates from this slot machine. And for many fans of the undead and that particular culture, that’s a great thing. Though do the slot features actually match up with the theme itself? Although there is a strong zombie vibe with Day of the Dead, it is really supposed to be all about the famous Mexican festival, evidenced by the Mariachi music that plays in the background. That’s a very fun aspect of the game. Instead of recycled sounds, beeps and bells and such, Day of the Dead actually has a cool, upbeat soundtrack to keep you entertained. The symbols are also very eye-popping, particularly if you have an HD screen, Smoking cauldrons and chalices, golden medallions and skeletons, fruit, and a team of dead Mariachis. It really is a visually pleasing game. Getting more into the game’s actual play features, Day of the Dead definitely stands out. Although it’s a basic 5-reel setup, there are actually 720 paylines! Even with the all-ways-win class of slots games, you’re only getting 243. This is triple the amount of paylines, which equates to multiple winning combinations. In fact, anyone playing this game is probably going to win more than they lose. The bad news here, of course, is that most wins are not very lucrative. But as long as you’re playing low stakes, it won’t matter. You’re probably at least going to break even. With wilds and scatters, you can also easily trigger the free spins bonus round, where you will have an opportunity to increase your winnings. This isn’t a great standalone bonus game, but it does the trick. The betting options of Day of the Dead are quite varied. For instance, you can choose to place a small wager on a set line, or you can increase your wager and really spread out your bet. And if you don’t feel like sitting there all day initializing the gameplay features, you can choose to cruise on autopilot with the auto-spin feature. It’s a great game for low to mid-level players, but the slot machine does manage to pay out some high-roller stakes from time to time. Overall, this is a good looking game graphically, the theme is very cool, and the fact that you can win on 720 paylines is amazing. On the downside, most of the wins to be had are actually quite small, and you might be playing a while before hitting anything big.